If you click the image you’ll be taken to Flickr where you can examine the Exif info and view the image in full size. Macro photography in non controllable environments is difficult. This one turned out perfect. The only one of about 50 images of this spider. Thanks. Very satisfied with this one. 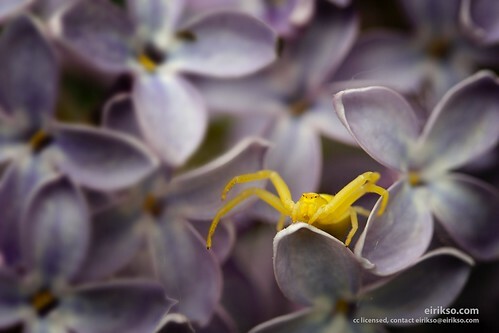 Nice contrast between the yellow spider and the purple flowers. And exact focus. Actually one big problem with this setting was motion blur. The flower was blowing in the wind, cusing quite a bit of motion.